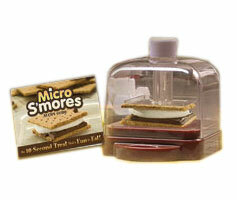 Everybody loves a great tasting smore and now you can make them in your microwave thanks to Micro Smores. This ingenious invention allows you to easily make delicious and gooeylicous smores in just 10 seconds. Say goodbye to the messy and inefficient stove top method and switch over to the new Micro Smores. The patented dome is designed to heat up quickly, allowing you to enjoy delicous smores much quicker than ever before. Plus clean up is a breeze too since it is dishwasher safe. With the included recipe book you can make 24 different kinds of classic and holiday recipe smores that you and your family can enjoy all year-round. You can order Micro Smores for only $9.95 plus the cost of shipping and handling. The free classic recipe book is included. You can also take advantage of a buy 1 get 1 free offer and get a second Micro Smores free. You just have to pay the additional shipping.